Judo is an internationally renowned grappling style of martial arts that originated in Japan. Even though Judo means the “gentle way” in Japanese, the application of its throwing techniques could be devastating and render a person unconscious in hand-to-hand combat. This article describes how Judo techniques and concepts can benefit Jiu Jitsu practitioners. Knowing how to properly land when you get thrown is a fundamental skill that needs to be developed. These types of techniques are commonly incorporated into everyday Judo warm up drills. The following are essential techniques to practice in order to prevent the likelihood of becoming injured during a takedown attempt. Forward and Backward Rolls – Jiu Jitsu practitioners should already have knowledge on how to perform forward and backward rolls. If not, then they should practice these techniques and learn to safely roll over the shoulder instead of their head which would cause unnecessary harm to the head and neck area. Whiplash Prevention – Be mindful to keep your chin tucked towards your chest as you are being thrown. This action prevents your head from bouncing off the ground when you land. Sideways Breakfall – Learn to fall on your sides and slap the ground with the same side arm as you are landing to reduce the throw’s impact on your body. Backwards Breakfall – In cases where you do get thrown directly onto your back, slap the ground with both of your hands out at 45 degrees angle from your body. Breakfall with Throws – Apply the breakfall techniques in actual throwing situations with a training partner. Judo throwing techniques are a great complement to Gi oriented Jiu Jitsu practitioners and will strengthen their standup game. Despite its reputation and heavy emphasis on using the Gi, traditional uniform, Judo does offer alternative grips and moves that directly translate to training without it as well. The following content focuses on how Judo could improve your takedown skills. Emphasis on Takedowns – Judo schools typically has a greater focus on teaching takedowns than ground work in their curriculum. It is the other way around for Jiu Jitsu. Therefore, training Judo will make you lethal on the ground and standing. Offensive Mindset – The Judo mindset is to attack and initiate the takedown. This will force naturally defensive Jiu Jitsu practitioners out of their comfort zone. Ippon – To earn an Ippon and win the match, Judoka (Judo practitioner) subjects their opponent to a devastating throw. 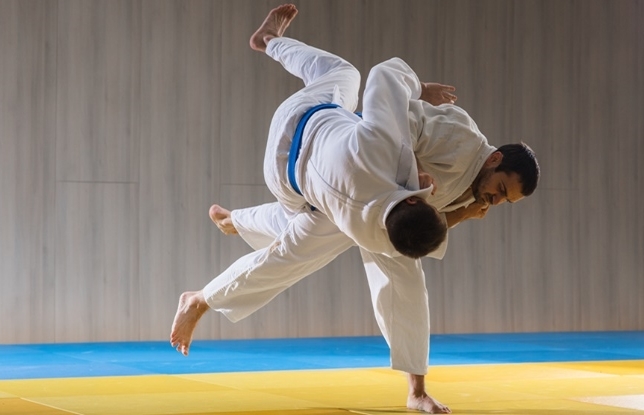 Although Jiu Jitsu competitions do not implement this Ippon rule, successfully throwing an opponent would allow you to progress to a dominant position or go directly to a submission attempt while this opponent is still recovering. Grip Fighting – Judo instructors often preach about the importance of grip fighting and using it for a purpose instead of grabbing onto a opponent’s Gi with a death grip just for the sake of having something to hold onto. Moreover, Judo will teach you how to utilize wrist control and grips to nullify opponent’s techniques and dictate their movements. Off-Balance – Judo’s setup for takedowns frequently rely upon being able to off-balance their opponent. Whether it is a simple pulling motion with both wrists or positioning the body to gain the advantage in leverage, these concepts and techniques will add great value to your current takedown arsenal. Momentum – Participating in Judo sparring sessions will grant you the finesse to employ feints and counter the opponent’s momentum. Entry – Jiu Jitsu practitioners lacking in standup experience tend to be sloppy and reckless in their attempt to clinch with their opponent. Practicing Judo with give you the expertise in penetrating into clinching range with footwork, grip advantage, proper body position and timing. Although Jiu Jitsu specializes in grappling on the ground (newaza) to a greater extent, Judo does have concepts and techniques that could be adapted to Jiu Jitsu. As you passed their guard, the opponent’s natural reaction to stop you from establishing side control is to stiff-arm you with both hands. Counter this reaction by turning your body and changing its angle. Changing your body position will put enormous pressure on the opponent’s wrists and they will no longer be pushing you in the direction where they are strongest. This creates an opening for you to dive into side control. Top Pressure – Judokas are notorious for their ability to generate top pressure and have even submitted other grapplers with this capability. Control – Since pinning is a viable option to gain points and even win a Judo match, you could learn to dominate control by adopting these pinning techniques that may be seem unorthodox to other Jiu Jitsu practitioners. Chaining Throws with Submissions – Standardized Judo competition rules grant competitors with only a short amount of time for groundwork following a takedown attempt that does not earn an Ippon. As a result, it is common in Judo to practice chaining a throwing sequence with a submission attempt. A different mentality is required to be competitive in Judo. The distinction of “going light” in a sparring session differs between Judokas and Jiu Jitsu practitioners. Relative to Jiu Jitsu, Judo sparring sessions typically occur at a faster pace and may seem rougher. And for this simple reason, Judokas are usually in better cardiovascular shape than their Jiu Jitsu counterparts. The following Judo traits could improve your success in Jiu Jitsu matches. Not Giving Up – Judokas do not simply accept getting taken down. They will fiercely fight for position reversals or scramble to their feet. This mentality would provide a nice change of pace for Jiu Jitsu practitioners who are more infatuated with getting opponents into their closed guard. Faster Pace – Helps improve your speed for getting into positions and attempting submissions. Decision Making – The intensity in Judo matches only allows for split-second reactions which promotes quick decision making. Stamina – The identity of Judo is to explode and utilize a lot of strength with their technique to escape from bottom positions. Combine this with their aggressive habits will force you to improve your stamina and conditioning. I’ve had Judo friends survive in high-level BJJ competitions just by pushing the pace and having more stamina than their competition. This article clearly shows that training Judo is highly beneficial for Jiu Jitsu practitioners. Stay open minded to Judo techniques and maximize your exposure to their sparring habits to become a well-rounded grappler who excels on the ground and standing up.